The North Fork of Shadehill Reservoir. Click to enlarge photos. 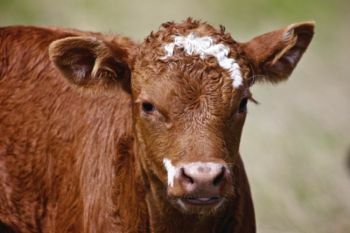 A spring calf on the pastures of the Grand River National Grasslands. 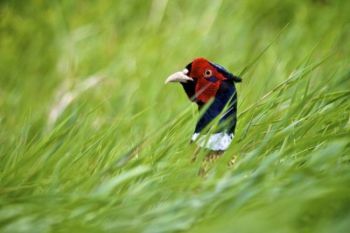 A rooster pheasant pops his head out of the tall grass along one of the National Grasslands roads. 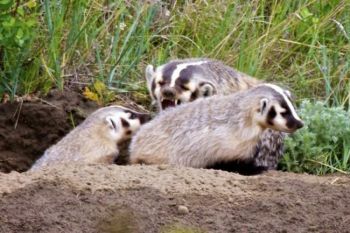 A badger playfully chides her cubs on the topside of their den found in a creek that feeds the southern arm of the Shadehill Reservoir. 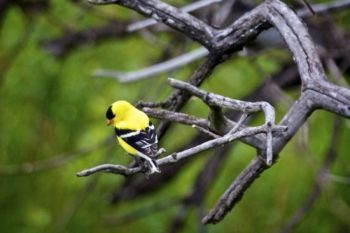 This American Goldfinch perches above the same creek. 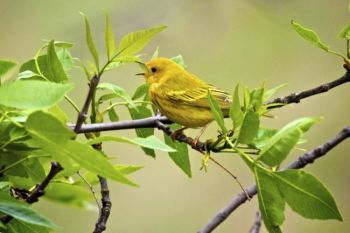 Happy morning song from a Yellow Warbler. 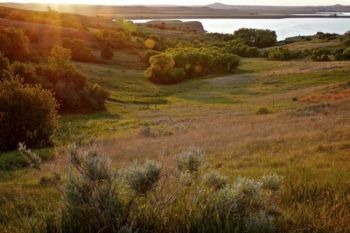 White Butte rises in the distance above the northern arm of Shadehill Reservoir. 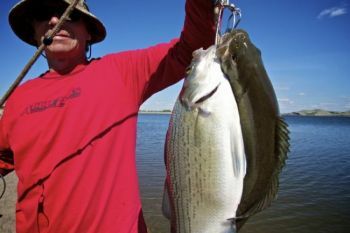 The fishing's good at Shadehill, as this happy fisherman's full stringer can attest. 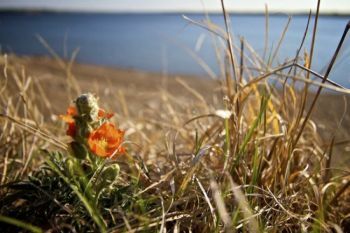 A scarlet globemallow blooming on the banks above the reservoir. Evening light on the reservoir. 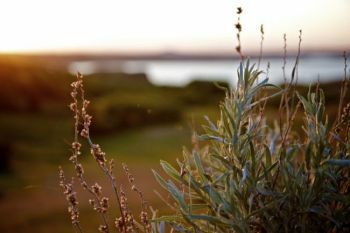 Sage in the evening light. Lack of light pollution makes for stunning night skies, as in this photo of the Milky Way. Predawn colors over the Grand River. Wildflower, rocks and cedar trees above the dam at dawn. Early morning mist above the Grand River. The Grand River at ground level just beyond the spillway. 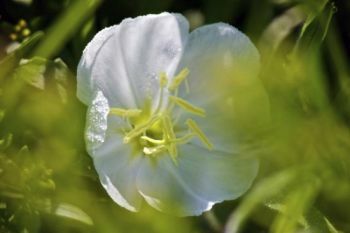 Gumbo lily in bloom in the Grand River National Grasslands. 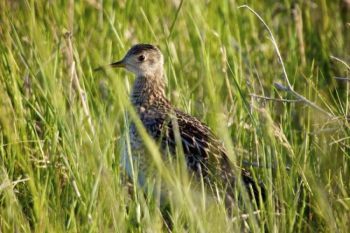 Upland sandpiper foraging in the Grasslands. 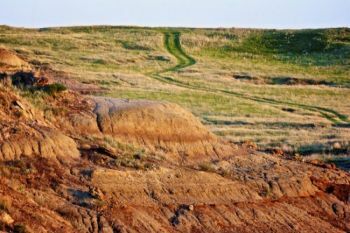 A view of the rugged Grasslands. 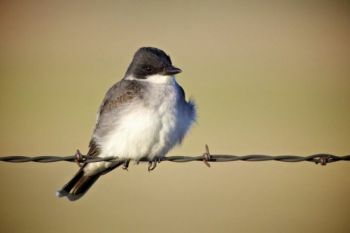 Eastern kingbird on a wire. 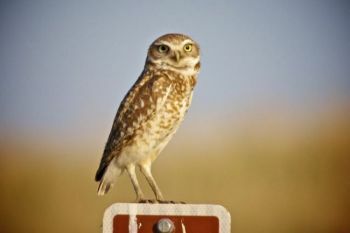 A burrowing owl perched on a Grassland mile marker. 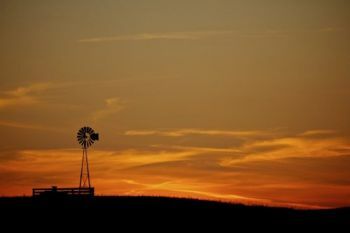 An iconic West River sunset courtesy of the Grand River National Grasslands. 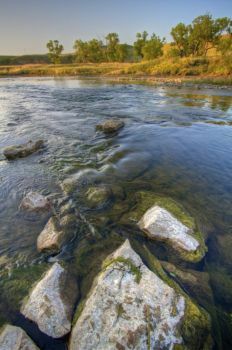 One of the greatest legends of the early American West was born somewhere near the convergence of the north and south forks of South Dakota’s Grand River. Frontiersman Hugh Glass was mauled by a female grizzly bear with cubs while he was out hunting alone in August of 1823. His companions left him for dead. Yet somehow he survived the ordeal and proceeded to crawl and float some 200 miles to the nearest fort on the Missouri near present day Chamberlain. The story is amazing if not epic. Those two adjectives could also describe the region of land that surrounds those same forks of the Grand River today. The Bureau of Reclamation created the Shadehill Dam and Reservoir in 1951 at the joining of the forks. 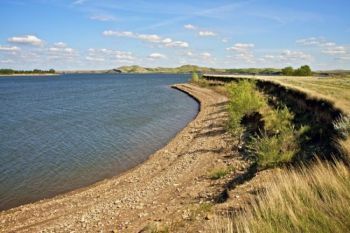 The reservoir and much of the adjacent land is part of the state park system and comprised of three different units (including one named after Hugh Glass). 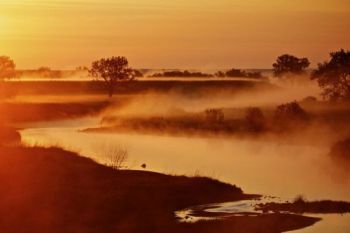 The Grand River National Grasslands is just beyond the parkland. For a wandering photographer like myself, it doesn’t get much better than spending a late May weekend drinking in the fresh air and wide open spaces these protected lands and waters have to offer. I grew up about an hour east and a little south of the area. Occasionally my friends would make their way to Shadehill for waterskiing and general fun. 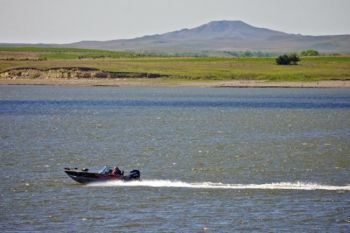 The waters haven’t quite warmed up for that kind of recreation yet, but cold waters won’t stop dedicated anglers. On my first afternoon at Shadehill I met some fishermen who traveled from the Black Hills area for the weekend. They proudly showed me a stringer full of a variety of fish. 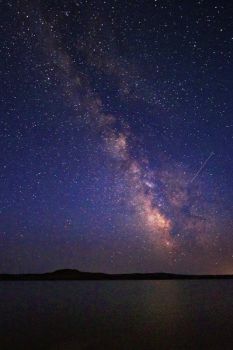 Later that night, I set my alarm for three a.m. in order to capture the Milky Way above the waters. One of the first things I saw as I rubbed my blurry eyes in the darkness was a blazing falling star lasting almost two seconds. I was wide awake after that. If you’ve never experienced the night sky where there is very little light pollution, you are missing out. 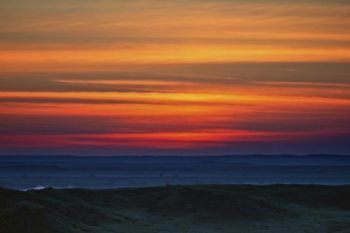 There is simply a sense of wonder in western South Dakota’s dark night skies. Later on, I positioned myself above the bluffs of the dam to get some sunrise shots. It was a chilly morning — 37 degrees with an accompanying stiff breeze. 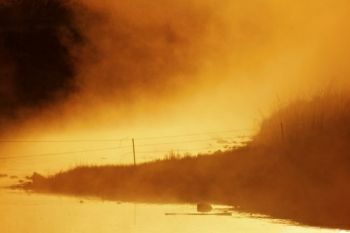 I noticed mists coming off the waters of the Grand River below the dam as the light bloomed in the horizon. The water from the reservoir’s release tube was much warmer than the brisk air above it and the result was a foggy steam that hung low on the river. This kind of scene is photographic gold. I took a few shots from the bluffs and made my way down to the river to shoot the steam against the rising sun. At this point I was in the zone, focused and intent on the scene in front of me. 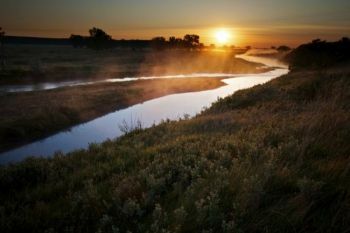 I walked briskly along the tall grass and sage on the riverbank when something happened I don’t think I will ever forget. I suddenly felt the ground, or at least what I thought was the ground, start to move under my right foot. A squawk erupted from under that foot, followed by a loud rustling commotion. A bellowing war whoop erupted from my deep inside my chest and my heart rose to my throat. I had stepped on a slumbering hen pheasant and she scared me half to death in her haste to get away. The good news is she was in flight before my full weight came down, so nothing but my pride was hurt. I’m glad no one saw or heard the ruckus as I’m sure “war whoop” is a very generous description of what actually came out of my mouth. 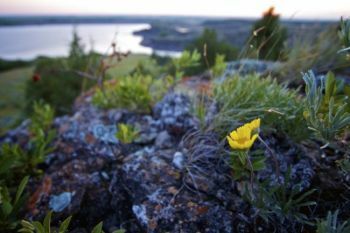 Later that morning I hiked five or six miles along the Blacktail trail in the Grand River Grasslands, enjoying prairie flowers, wildlife and bird sightings. Like I said before, the whole area is a photographer’s dream — at least this photographer’s dream. But don’t take my word for it. Why not take a weekend to check the area out yourself? My only caution is to simply watch where you step. Beautiful shot of the milky way! Is the straight line in the picture a satellite? wish Jay Leno could see this.... so much more to do in our beautiful state than Mount Rushmore.... thanks for sharing this beauty!!! Thanks for the kind words. Mark, I'm not exactly sure what the straight line is as I didn't notice it when making the exposure. If I had to guess, it would be a satellite. I would think a plane would have travelled more distance across the sky in 30 seconds and sometimes you can make out red dots of light as they go along which I didn't see in this image.